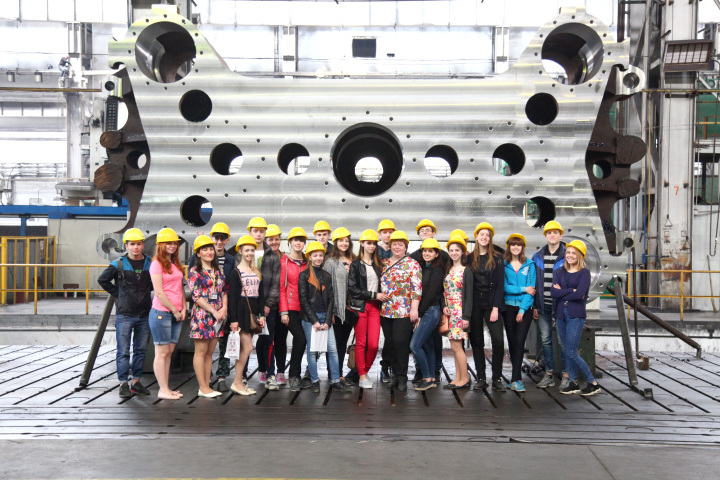 The pupils of the 10th-A form school № 19 visited PJSC Energomashspetsstal. The introductory tour was arranged by Human Resources Department. The fact that PJSC Energomashspetsstal is one of the largest enterprises of the city, the guys know for a long time. Though substantially no one knew what products PJSC EMSS is able to manufacture. As part of the tour, high school students got acquainted with the working processes of arc-furnace melting shop, press forging shop, heat treatment shop and machining shop. Most of all the pupils were impressed not by a certain shop, but by the production cycle in its entirety. “The capabilities and scale of production amazes my mind. Practically I do not have any knowledge of engineering, and due to this tour by the shops, I can imagine the wide range of products that PJSC EMSS is able to manufacture. Press Forging Shop with its huge presses and furnaces made a deep impression on me, “- says Arthur Artyunov, a student of the 10th-A form. Such kind of excursions are held annually at PJSC EMSS and not only for the students. Our enterprise cooperates with Employment Center of the city Kramatorsk, Mechanical Engineering College of Donbass State Academy and other organizations. Specialists argued, such events help students to make the choice of their future professions. “Definitely, such excursions are very important for high school students, broaden their minds and of course it is useful experience for the choice of the future profession. It is quite possible that some of them will become the specialists in machine industry. Moreover, the professions related to this industry are very demanded nowadays”- says Anna Shram, Lead Careers Officer of the Employment Center of the city Kramatorsk.